As a result of the ongoing shutdown, the government won’t be able to promptly pay Washington D.C a $5 million water bill for services to federal buildings. With 195,000 employees, the federal government is the city’s largest water customer. Those employees work in dozens of federal buildings and all of that toilet flushing, hand washing and other water use adds up. The bill? Some $16.5 million, of which the federal government has paid $10.5 million. The story was first reported by WAMU. According to the water utility, the federal government’s bill is not past due as it traditionally pays at the start of each fiscal quarter for water and sewer services. “We anticipate the outstanding balance for the second quarter will be paid in full once the shutdown ends,” Vincent Morris, a spokesman for the utility, told ABC News. Still, the delay has raised some concerns among members of the District of Columbia Water and Sewer Authority board. Some on the utility board raised questions over whether they will shut off services eventually or charge late fees. “1600 Pennsylvania Avenue is that what you’re talking about?” Another board member asked, a response that was met with laughter. 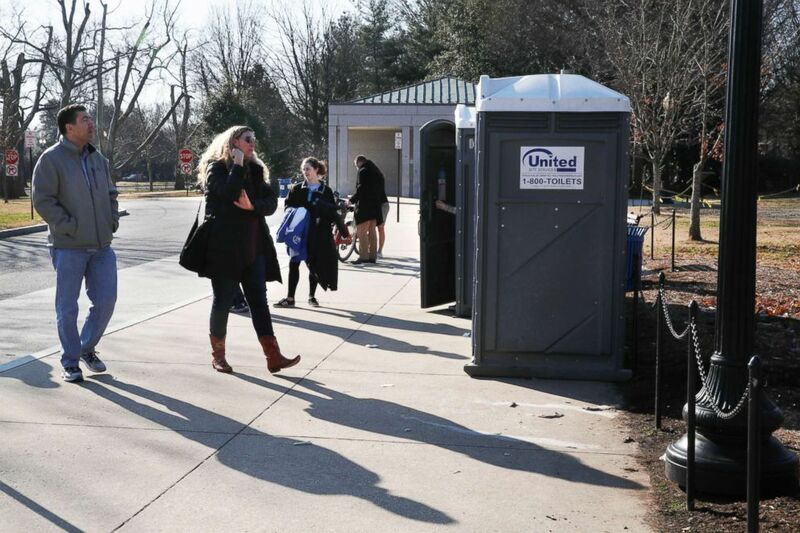 With the regular bathrooms closed during the government shutdown, tourists wait in line for port-a-potties while visiting the World War II Memorial, Dec. 26, 2018, in Washington. Under DC law, water can be shut off to any building if payment is late by more than 30 days. After 60 days, the city could take over the property until the debt is paid. The board discussed during the meeting whether to eventually apply late fees. However, Matthew Brown, the chief financial officer at the water utility said they usually don’t charge late fees to customers like the federal government and the delayed payments won’t immediately hurt the water authority’s pocketbooks. 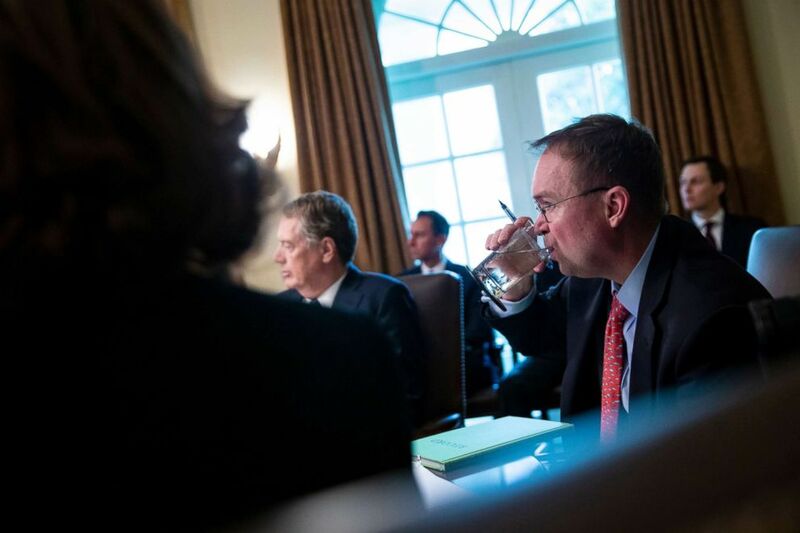 Mick Mulvaney, acting White House chief of staff, takes a drink of water during a cabinet meeting at the White House, Jan. 3, 2019. “It would probably be, just off the top of my head, approximately a year before it begins to be a real problem,” Brown said. President Donald Trump and congressional Democrats have been in a protracted standoff over funding for the president’s long-desired and much-promised border wall. The ensuing government shutdown has now lasted 19 days. However, shutting the water off any time soon is unlikely, Morris told ABC News. “We obviously go to great length not to shut off water for anybody in any circumstance,” he said.